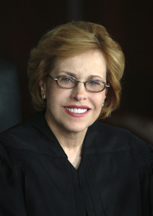 Before taking the bench, Chief Justice Marilyn Kelly was a courtroom attorney for 17 years in Michigan. Her practice was diverse in subject matter and geographic area. In 1988, she was elected to the Michigan Court of Appeals for a six-year term and reelected in 1994. She was elected to the Michigan Supreme Court for an eight-year term in 1996, and reelected in 2004. Justice Kelly was raised in Detroit and graduated from Mackenzie High School . She earned a B.A. degree from Eastern Michigan University in Ypsilanti . After a year’s graduate study at LaSorbonne, University of Paris, France, she received her master’s degree from Middlebury College in Vermont. She taught French language and literature in the Grosse Pointe Public Schools, at Albion College and Eastern Michigan University before attending law school at Wayne State University . She was awarded a law degree with honors and serves the law school now on its Board of Visitors. Justice Kelly is a member of the Oakland County Bar Association where she has been active as Chair of the Family Law Committee and Committee Co-Chair of the President’s Task Force on Improved Dispute Resolution. She has been an arbitrator with the American Arbitration Association and a panel member of the State Attorney Discipline Board. She is editor of the 6th Edition of Michigan Family Law published by ICLE. In 2003, Justice Kelly became a Fellow of the Michigan State Bar Foundation. She was elected statewide to the Michigan State Board of Education in 1964 and again in 1968, and served twelve years on the Board, the last two as its President. She has been President, in addition, of the Women’s Bar Association and of the Women Lawyers’ Association of Michigan. She has been a member of the State Bar Representative Assembly and the Family Law Council for the State Bar of Michigan. From 1999 through 2003, Justice Kelly was co-chair of the Open Justice Commission, an organization of the State Bar devoted to making justice available to all, regardless of factors like race, color, creed or disability. Justice Kelly is on the governing board of the National Consortium for Racial and Ethnic Fairness in the Courts. Her community service has included Board Member of Channel 56-Public Television in Detroit, board member of the Women’s Survival Center in Pontiac, Vice President of the Board of the Detroit Institute of Technology, Development Committee member of St. Joseph Mercy Hospital in Pontiac and member of the citizens advisory committee of the Detroit Public Schools, Wayne County Community College and Oakland County Community College. Justice Kelly has been awarded honorary doctor of law degrees by Eastern Michigan University and Michigan State University College of Law, and its Distinguished Service Award by the Michigan Education Association. She has been selected by Corp! magazine as one of Michigan’s 95 most powerful women. In June 2003, Justice Kelly received the Eleanor Roosevelt Humanities Award from the State of Israel Bonds Attorney Division. The State Bar of Michigan presented Justice Kelly with its Michael Franck Award for her outstanding contribution to the legal profession at its annual meeting in September 2003. In 2005, she was honored by Wayne State University as one of the university’s outstanding alumni.